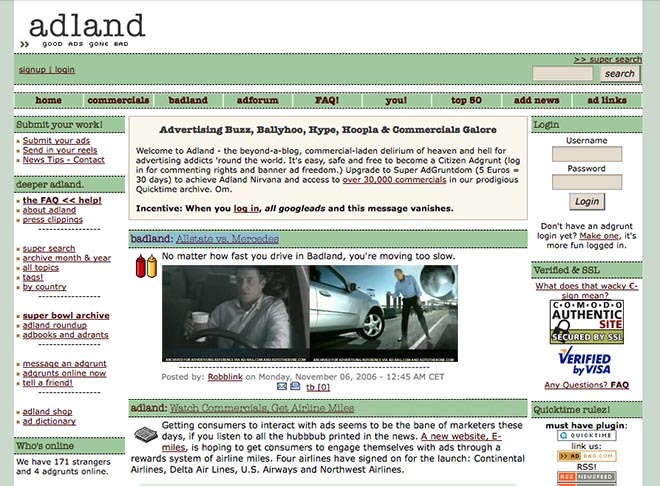 Adland, AdRag, Commercial Archive – whatever we call it, this is one of the ultimate advertising sites in the world. Adland was started by åsk wäppling in 1996. She’s a Swedish creative partner/art director based in Denmark, usually known as Dabitch. Other crew members are Clayton T. Claymore (Ad to the Bone), Caffeine Goddess Jane Goldman, Robblink Robert Ho, and web designer Cip. As of tonight there are 76850 registered users or ‘adgrunts’ – people who are committed/addicted to viewing and reflecting on ads, in and out of the advertising industry. Users can move in and out of ‘super adgrunt’ status by paying a nominal fee, allowing access to over 35,000 quicktime videos hosted in the Commercial Archive (most with the words “Archived for advertising reference via Ad-Rag.com) . Each adgrunt has the freedom to submit stories for consideration by the crew. Badland, a site designed to expose plagiarism, intentional and unintentional. Adlinks, a comprehensive list of advertising magazines, awards, collections of ads, creative & freelance agencies, illustrators and art, adgrunts blogs, advertising schools, fonts, ideas, information and mailing lists, photographers and stock, production houses and post, TV commercial sites, portfolio pages, and bizarre ads.